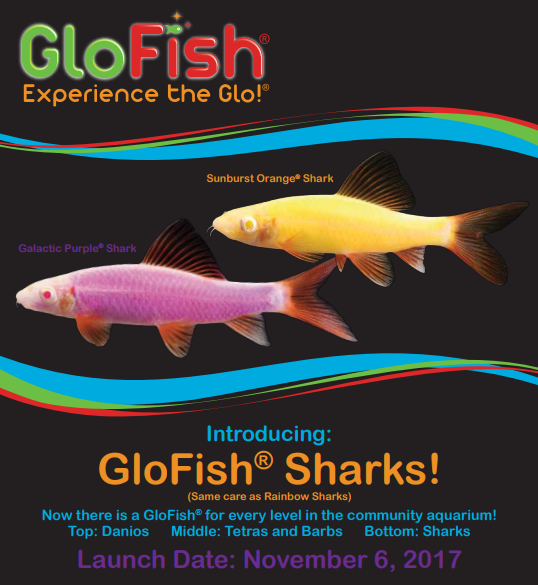 New Rainbow Shark Glofish® Make Their Debut Next Month! We are extremely excited to announce the first new species in the GloFish® line since Tiger Barbs! Rainbow Sharks are a welcome addition to the line, being a significantly larger (max size roughly 4 inches) fish as well as one that tends to stay near the bottom of the tank. Now with Danios, Tetras, and Sharks, your customers can have GloFish® at every activity level in the tank, top, mid, and bottom. Care is exactly the same as a normal Rainbow Shark, but with the famous GloFish® color! The initial offering includes the Sunburst Orange® Shark and Galactic Purple® Shark. With a launch date of November 6, 2017, you can expect to see these colorful fish making their appearance at your local fish store. Retailers, place your pre-orders with Nautilus Tropical Fish Wholesale.